Some people need to watch their caffeine intake, others may want to. 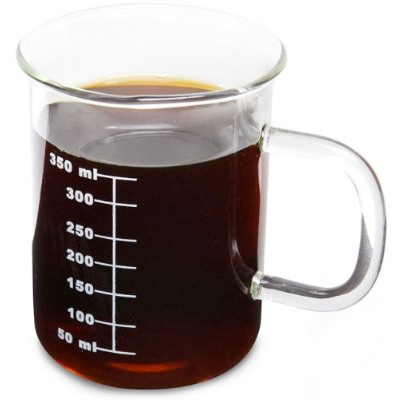 Well, the way to do that quickly and easily is with the Laboratory Beaker Mug . With a capacity of about 12-ounces, the glass beaker-that-looks-like-a-mug is sure to keep coffee drinkers alert, awake and paying attention to anything and everything. Coffee is Chemistry, so treat it as such If you’re awesome, you know that coffee’s heavenly taste comes from a perfect balance of acids – aliphatic, chlorogenic, and alicyclic carboxylic acids and phenolic acids, and sweet roasted carbohydrates in the form of mono and polysaccharides and sucrose, and alkaloids. Hundreds of different individual chemicals! The combinations of which depend mostly on the roast, skill of the roaster, and even the kind of brewing pot you use. The bottom line is, your coffee mug is full of chemistry, so why are you sipping your bitter black brew from a simple and boring ceramic mug? Where’s your science, man? Step up to the big leagues, and drink deeply from your very own 400ml laboratory beaker! The glass handle keeps your dainty fingers from burning, while the graduated markings on the side proclaim this to be a vessel of science. Not vessel as in starship, you know – vessel as in container… but why wax synonymic when I could be making a second cup of coffee?